Play with it awhile. Look at it upside down. Listen to your gut. It’s fun to solve problems and see things the way only you can. Dare to be wrong. Try new things. Use your voice to express your ideas and questions. Today is your day to explore your world. Know how you feel. Listen to your friends' feelings. With empathy, we can value differences and be kind to each other. It’s a way of being that stays with our students long after school’s out. Long past graduation, too. 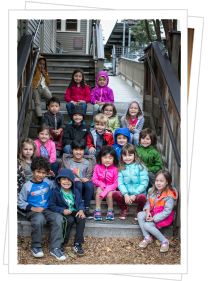 Bertschi kids thrive at becoming independent individuals who share and participate in community. Their stature may be small, but their ideas are monumental. LEGO® Education announced the first cohort of the US LEGO Education Master Educator program including our very own Julie Blystad (Science Specialist) and Joey Tanaka (Technology Integration Specialist). The latest podcast of Bertschi alumna Julia Drachman '03 features our Living Building as well as faculty, staff, and alumni. We are thrilled to share our new Strategic Plan 2018+.